A timely release given recent events in Gaza, the 1966 war movie Cast a Giant Shadow takes us back to the early days of Israel's quest for sovereignty. Written and directed by Melville Shavelson (Yours, Mine & Ours), the film is both quaint and illuminating. It's also a little bit depressing, in that it reminds us how long there has actually been conflict in the Middle East and how much of the fight has fundamentally been over the same things. 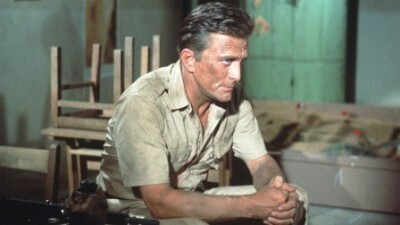 Cast a Giant Shadow is set in 1947 and stars Kirk Douglas as Col. David Marcus; Mickey to his friends. Mickey was a soldier of some distinction in World War II, though known as much for his disregarding the letter of the law when it came to orders as his unconventional success. Now that there is peace, Mickey is looking to live a quiet life stateside with his pregnant wife (Angie Dickinson). This changes when he is approached by an Israeli emissary looking to recruit an American officer to consult and aid the country's freedom fighters. Reluctant at first, Mickey can't resist another battle and the chance to protect his heritage, so against protests from his spouse and his commanding officer (John Wayne), he heads overseas. The first half of Cast A Giant Shadow is Mickey becoming acquainted with the situation and the troops. He joins a small band of soldiers led by Asher Gonen (Yul Brynner), a devoted leader and true believer. Asher's scrappy army consists of both men and women, young and old alike. Mickey is particularly drawn to one dedicated freedom fighter, a tough lady named Magda (Senta Berger), whom he eventually comes to respect as an equal. Mickey also learns about the enemy, both the Arabs who don't want there to be an Israel and the British who have appointed themselves to police the region. The second half of the movie comes after Mickey's first trip back home, when he realizes how isolated Israel is from the international community. Finding little support in his fellow Americans, Mickey heads back to the country to take command of the troops himself. Now with a more international band of volunteers, including a pilot from Jersey (Frank Sinatra) with a taste for the drink and a love of action, Mickey leads a mission to establish an outpost in Jerusalem, the key to holding the territory and inspire the rest of the world to come on board. Shavelson, who based his movie on a book by Ted Berkman (Fear Strikes Out), takes a journeyman's approach to the material. He moves from point A to point B with little fuss and a rather conservative aesthetic. There are no breathtaking "great shot" moments in Cast a Giant Shadow. Rather, all the effort on the part of the director and his director of photography, Aldo Tonti (Reflections in a Golden Eye), is spent maintaining a strained surface realism. This aim suffers greatly on some of the chintzy sound stages the crew has built their interiors on; they do better at convincing us the Italian outdoors is actually Israel. Their combat sequences are passable, as is the movie overall. Cast a Giant Shadow drags in its second half, but it's also better the more the straight line is maintained. The brief digressions into Mickey's storied past come off as just that: stories. And not ones that jibe with the rest of the movie's historical narrative. Which is really what makes Cast a Giant Shadow the most interesting, that we are getting a look back through time at the origins of a relevant current event--albeit refracted through a Hollywood lens twenty years after the fact. What's unsettling is how the threat to Israel, and the rhetoric surrounding it, has hardly evolved in the intervening decades. That said, it is still only one part of the story, and from one point of view. Don't expect this film to illuminate the entirety of the region's conflict. If this all sounds like a mild recommendation, that's because it is. 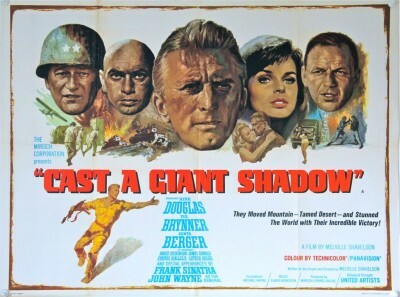 What of the story and the performances in Cast a Giant Shadow? As I noted, the tale falters once its past the halfway mark. You'd think the half with the most combat would be the more compelling, but alas, it's not. That said, the cast does work that is better than the script they've been provided. Douglas, unsurprisingly, is solid as a rock, and Brynner makes for a strong ally and foil. The one misstep is from Topol, the actor famous for his portrayal of Tevye in Fiddler on the Roof. Here he plays a cartoonish sheikh Mickey is looking to make a financial arrangement with. The caricature is so broad, it nearly tips Cast a Giant Shadow over the line into propaganda. Shot in a widescreen 2.35:1 aspect ratio, Cast a Giant Shadow receives a 1080p high-definition transfer that is decent, though not great. Colors appear fine, looking fairly accurate to the 1960s film stock. Detail is very good, though resolution can be soft. The image is also too grainy at times, to the point that it appears to be haziness rather than an intentional cinematic effect. Blemishes or marks, thankfully, are few. The DTS mix of the English soundtrack modifies the original mono for stereo systems. Tones and volume are fine, and I didn't notice any drop-outs or other glitches. Rent It. Cast a Giant Shadow is an interesting artifact, caught somewhere between Old Hollywood and the burgeoning realism of 1960s cinema. It has a certain grave nostalgia for World War II, albeit applied to a period after the conflict, focusing on the fight to establish Israel as a sovereign nation. The story begins in 1947, though the film is from 1966. It stars Kirk Douglas as an American veteran who joins the crusade as a consultant before eventually taking over the ragtag Israeli army on his own. Melville Shavelson sticks to a direct, no-frills storytelling approach, but the final edit is plodding, going on too long and at times casting its focus in the wrong direction. Still, fine performances and an intriguing historical backdrop allow Cast a Giant Shadow to remain at least somewhat interesting.